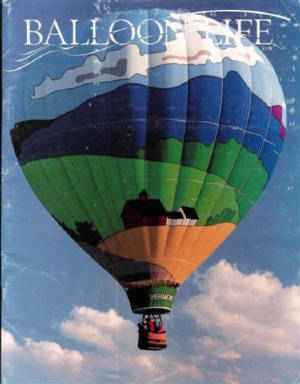 Cover of September 1989 issue featuring articles on "The Flying Allens". Between the years of 1912 and 1975, Captain Eddie Allen, son of Comfort Allen, made more than 3,000 parachute jumps from hot air balloons. His last performance was in 1975 at age 80. During that jump, while at 1,000 feet, his parachute failed to open properly. His injuries included broken bones and internal injuries. Many honors have been bestowed upon the pioneer balloonist who died at age 87. Some of the "Flying Allens" equipment is with the Smithsonian Museum as well as a local museum in his hometown. He has been honored with festivals, horse races, his own "Eddie Allen Day", and by aeronauts and astronauts from all over.